The very popular Android-based HDMI streaming media player, the Google Chromecast, is finally available in Canada! For the first time, Amazon.ca is now offering the Canadian compatible version of the Chromecast. The Chromecast is a small device that plugs in directly to the HDMI port on a TV and offers many online entertainment options for your TV. There is a growing number of apps. Some notable apps include Netflix, YouTube, Google Play Movies and Music, and most importantly Chrome. The Chromecast is controlled by your mobile device. 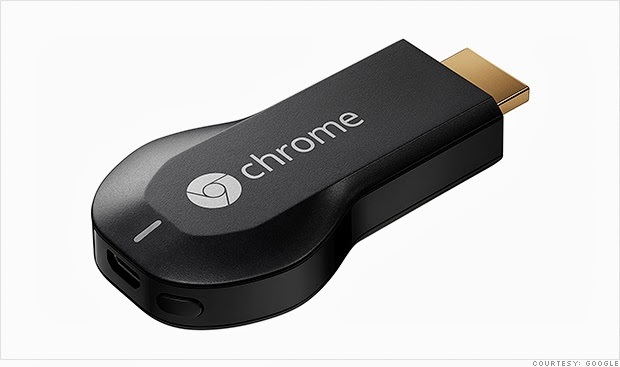 The Chromecast supports Android, iOS, Mac, Windows, and Chromebook devices. The Chromecast is powered by the included USB cable and power adapter. The Canadian model is $39 with free shipping from Amazon.ca . Amazon is currently the only dealer of the Canadian Chromecast.